Are you ready for my first review and giveaway of 2016? Jesus Today: Devotions for Kids is a children's devotional book, for kids in the 6-10 age range. 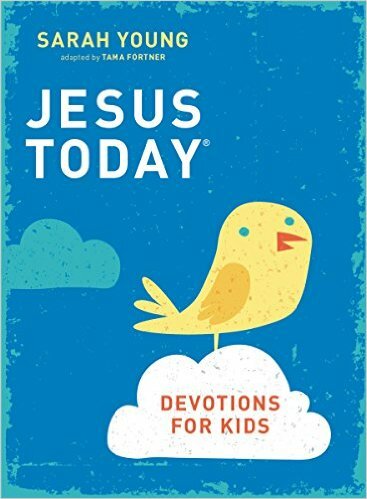 It's a hardcover book of 150 devotions, with the main theme being "Jesus is a Friend who is always by your side." My honest opinion: I love the idea, and the content. This is a unique devotional book that is written as though Jesus is speaking directly to the readers, assuring them He is in control of their lives. Plus, each devotion includes Scripture verses to go with it, which is very important for kids to read and know. The only thing I did not like about the book is the look of it. I guess it is meant to look like an old, worn book, and maybe the publisher has a reason for this that I don't know about, but to me (a detailed person who loves to see things neat and tidy), I just wasn't impressed with a book cover that looks old when it really isn't. However, I would not let the look of the book keep you from purchasing it. The content is good! When the book is open, the devotion is on the left side. The right side has Scripture verses to go along with the devotion. The verses included with devotion #32 are John 21:19, Psalm 23:1 & 4, and Psalm 18:28. Enter below for your chance to win your own copy of this book. Entries will be accepted until Saturday, January 30, 2016, at 8:00 p.m. CST. Must be 18 or older to enter. One entry per mailing address.